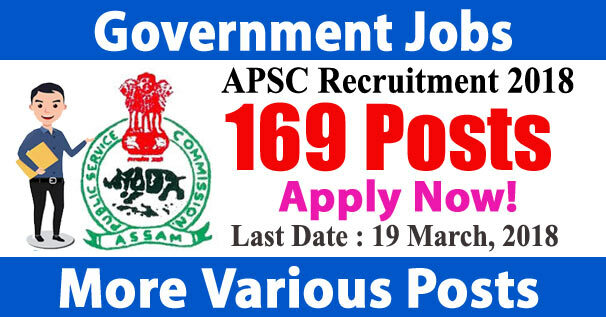 APSC Recruitment 2018 - Under Assam Public Service Commission (APSC), there is recruitment for the vacant posts of Veterinary Officer/Block Veterinary Officer : 113, Fishery Development Officer : 47 etc. application are invited online from the desired and eligible candidates for total 169 posts. Its recruitment advertisement/ notification no. is 01/2018. In respect of this recruitment, the vacant number of posts is 169. Some among the given posts as per rule are reserved for the candidates of different categories. The number of posts may decreased or increased. Starting date for online application registration is 17 February, 2018, Date of application Fee deposit is 19 March, 2018 and the last date for the application submission is 19 March, 2018. For more information as about total no. of posts, age limit, educational qualification, selection process, application fee, important dates, how to apply etc., regarding this recruitment visit the official website of APSC http://www.apsc.nic.in. On this website online application facility is available. Education Qualification : The desirous candidates who want to apply for the job should have B.F.Sc degree/ Degree/ Diploma branch of Medicine/ Master’s degree in statistics, maths, economics/ Bachelor’s degree in Animal Husbandry & Veterinary Science/ Any Stream from any recognized board/ university/ institute. Other education qualification details please go to official notification. Age Limit : Candidates age should be between 21 to 43 Years (Post 1,4,5), 23 to 43 Years (Post 2), 35 to 45 Years (Post 3) As on 01-01-2018. Upper age relaxation will be given to reserved category as per the organization norms. More details please go to official notification. Pay Scale : Rs. 30,000 - 1,10,000/- with Grade Pay 12,700/16900/-. Selection Process : All Eligible Candidates will Be Selected Based on Their Performance In Screening Test, Interview. How to Apply : All Eligible and Interested candidates Can Download application Form through official website http://www.apsc.nic.in. After Filling The application form, candidate must send hard copy of application along with relevant testimonials (Mentioned In Detailed Advertisement) to the following Address before or on 19th March 2018. Postal Address : Under Secretary, APSC, Jawaharnagar, Khanapara, Guwahati-22.